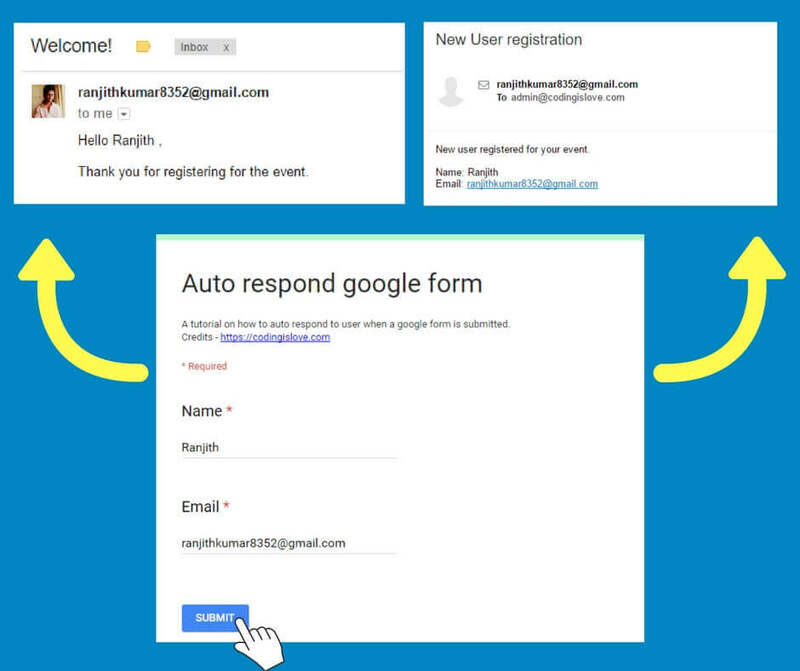 One of the most requested features in google forms is auto-respond but still it is not built in with google form. But we can add this feature with just 2 lines of code! Yes, you heard it right! It’s literally 2 lines of code. Let’s do it. Every google form can be associated with a google spreadsheet to receive form submissions. Code for auto respond will be added in this spreadsheet. Every spreadsheet with google form association has a form submit trigger which sends an event object with form data. So all we have to do is write a function for getting that form data, send email using sendEmail function and add a form submit trigger to that function. Fill in the form, you will get an email with a welcome message and I will get a message with new user submission! Try it out and start creating this auto responding form. Add form fields as required. I’ve added Name and Email fields in the demo form. Link a spreadsheet to the form by clicking on the spreadsheet icon in responses tab as shown in image below. var name = e.namedValues.Name, email = e.namedValues.Email, adminEmail = "[email protected]"
This 2 lines of code is all you need to add auto-responding email feature to google form. A form submit trigger sends an event object which contains form data which can be used to get the user details and send him an email. Next step is to get the form data. Event object has 2 properties namedValues and values. Either of them can be used to get form data. values is an array with form field values in the order as they appear in the form. namedValues is an object with field names as properties and field values as values. Read more about event objects here. We are using namedValues in this code. Save Run this code once by clicking on the play button in the script editor > a dialog pops up for permissions > continue and allow. That’s it! Now Whenever someone fills your form, they get a welcome message. Customize it as per your needs. You can add more functionality like sending an email to yourself with new form submission’s details. Just add one more sendEmail function with your To Address and appropriate message. 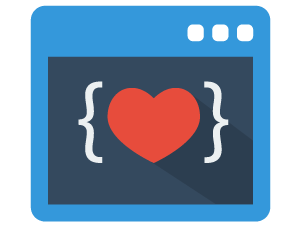 var name = e.namedValues.Name, email = e.namedValues.Email, adminEmail = "[email protected]om"
We’ve been sending plain text emails till now, We can send HTML Emails using htmlBody parameter as mentioned in the documentation. I’ll be writing another post on how to send full fledged HTML Emails from google sheets. Meanwhile, try it out by reading the documentation! var name = e.namedValues.Name, email = e.namedValues.Email, adminEmail = "[email protected]"
Have a look at complete code which is at the end of the post. It is used to send another email to owner of google form. Looks like you haven’t setup trigger or you are running the code manually. This code should not be executed manually. It should be triggered by a form submission. When you press run, as you say to do before linking the trigger, this is what it says. It also says it AFTER the trigger is linked. I have sent a test form and not email arrives. Perhaps there is something or that you are not explaining? I got it to work. But it doesn’t work if you have more than one tab in your Google spreadsheet. For example, I have a main spreadsheet that collects the main data, but then this gets sifted into three other spreadsheets on different tabs. Is there a way to specify this script just for that main spreadsheet? Thanks. Forget what I said earlier. I got it work. I’ll look around your site to see if you have code for attaching pdfs. What was your solution to the different tab in the spreadsheet? is there anyway someone can help me? I am trying to send an email after a certain answer is entered using my form. So if some enters active, then an email is sent to a certain group. If someone selects kiva, then an email is sent to a different group. Is this posibble? Is there a script already out there that I can tweak? You can tweak the above example code. Does anyone know how I can return a cell that contains a hyperlink to send in the email? I’ve gotten the automation working and it will send a plain text message, but it will not recognize a link in the cell. I’ve searched for so long and cannot find anything to help. ie. The document name appears in the cell, and contains a link to the real document, which is a really long different name. I want just the short name to come over but to maintain its link properties. Thank you for any help! How do I reference the default email collected in google forms? It is listed as “Email Address” with a space when stored in the google sheet, and is in columnB (with columnA having the date). Is there a way to use a field name that has a space, for example First Name . When this is put in the script editor it only picks up the “first”. I’m having a problem with “on form submit”. I have a spreadsheet which accept responses from TypeForm. But I cannot use “on form submit” trigger with TypeForm. – if some new row is inserted in my spreadsheet and give me that row contents. i.e. it always executes on new row insertion and give me that row contents. I’ve spent lot of hours but can’t find any solution. Any ideas why it could be?